Decopatch or decoupage. Novice or expert. 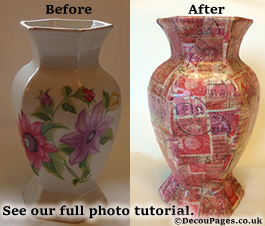 Welcome to DecouPages, your online guide to decopatching and decoupage. We'll be constantly updating the 'Decopatch Goodies' section of this page so you'll know when there are new Decopatch papers and blanks available. Get tips and find inspiration. Learn how to decopatch with our step by step guides and photo tutorials. Get ideas on how to recycle items around your home by giving them a new lease of life through the wonders of decoupage and decopatching. If you are stuck (sorry, no pun intended), our handy glossary of Decoupage and Decopatch terms and our FAQ section should help. Not sure about the difference between decoupage and decopatch? Read our article that explains the history of decoupage and decopatch. If you're planning a kid's craft event then our article on Decopatching for children will give you some handy hints. Find out what essentials you'll need to get started with decopatching. Learn about the equipment available for more complex projects. 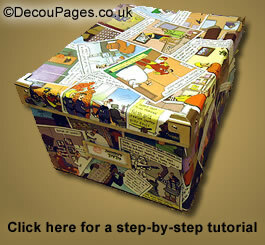 Learn about the different products and brands of decoupage products available. See the latest decopatch products and get fresh inspiration. We're adding more content over the next few weeks, so bookmark us and visit again soon. We are really impressed with the latest deco patch paper designs from Deco Mache. 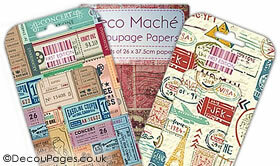 Not only are their decopatch papers made to a very high quality, but they have a great range of fun and quirky designs. We really like the designs which feature a variety of stamps, tickets and maps. Click here to buy your Deco Mache papers. It's great to have a range of designs that are a bit different. It is useful to have access to a range of deco patch papers with a more unisex appeal. Look out for Tartan decopatch paper. 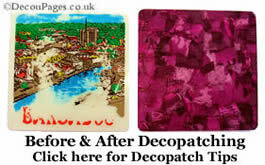 There are some great new decopatch blanks available. The photo booth accessories are great for weddings and parties as you can decorate them to fit the theme. There are several new designs of photo frames available as well. These would make great gifts when decorated with the recipient in mind. Decopatching is great for home decor items. You can add a unique touch to your home without breaking the bank. 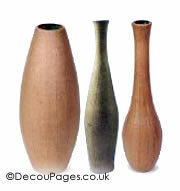 You can now get Decopatch vase blanks to decorate as you wish. Double check that you are buying the waterproof blanks so you will have a practical addition to your home decor. If you want to try making decopatch jewelry then the bangle and ring blanks are a great place to start. Following on the heels of the over 50 life-sized gorillas that were on display around Norwich and 80 giant Gromits in Bristol, London and Bristol have both had Shaun the Sheep sculpture trails. Sheffield has also joined in the fun with the 'Herd of Sheffield'. 58 5ft 2in tall elephant statues are on display around the city. Although some of the designs were painted, you can easily see how you could get the same effect using decoupage. These sculpture trails also show how effective a large statement piece of Decopatch can be. 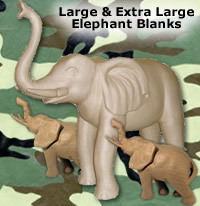 There are several extra large Decopatch blanks available, including cow, tree, elephant, scottie dog and giraffe blanks.